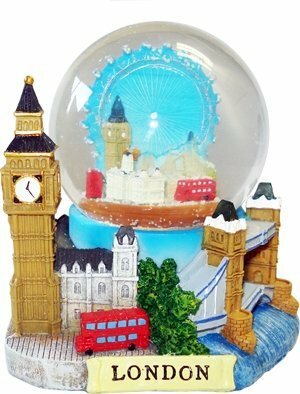 Snow Globes 3D (Small)- London Collage, Detailing London Landmarks Big Ben, Tower Bridge etc. by Snow Globes at Passion Missions. MPN: unknown. Hurry! Limited time offer. Offer valid only while supplies last. A 3D snow / water globe detailing famous London Landmarks Big Ben, London Eye, Tower Bridge, St. Paul's and Buckingham Palace. Small size (45 mm). A 3D snow / water globe detailing famous London Landmarks Big Ben, London Eye, Tower Bridge, St. Paul's and Buckingham Palace. Small size (45 mm). London collage design. Also available in medium and large sizes. The presentation box does not come in a good shape due to the weight and shape of this ornament, But it is a very attractive little (small) snow globe to go on display!